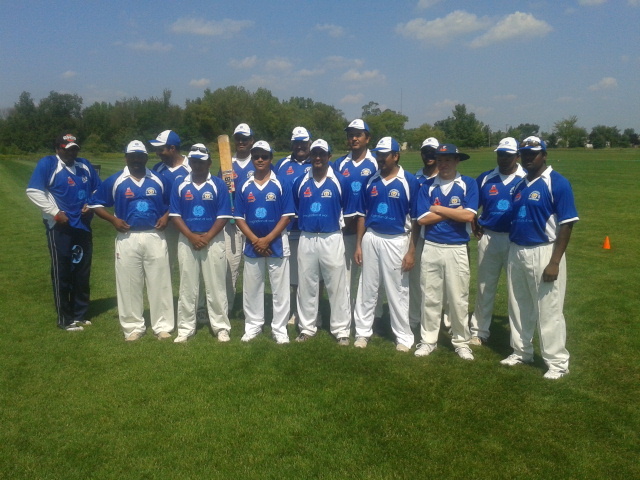 MichCA has announced that Ford won the U. S. Corporate Cricket Championship at Bloomer Park, Rochester Hills, yesterday (Sunday, 26th August). Ford, who beat G.E. twice in group matches on Saturday, knocked out second-ranked Caterpillar in a tight semi-final, and then narrowly defeated top-ranked Chrysler (victors over Tata and Infosys in group play, and G.M. in the semi-finals) to take a record fifth championship. This year, for the first time ever, a draft of available guest players took place: every corporate team was able to add to their squad up to four Michigan cricketers not affiliated with their own business; teams were also able to select one U-19 player. Three MCA players took place in the tournament – seventeen-year-old Ani Mayasandra, a second-round draft pick for Infosys, who carried his bat for an unbeaten 55 (his maiden half-century) in his team’s victory over Tata, and was Man of the Match; sixteen-year-old Gordon Makin, a youth pick for G.E., who opened the batting and kept wicket in his team’s two matches against Ford (Gordon top-scored for G.E. in the first match); and twenty-one-year-old Anurag Yerabati, a fourth-round draft pick for Blue Cross Blue Shield, who played in one match for his team and performed very creditably (full details not available at the time of writing). Provisional scores for the first day of the U.S. Corporate Cricket Championship, organized by the Michigan Cricket Association, suggest that the familiar big-name teams did well (Ford, Chrysler, Caterpillar, G.M. ), but also tell a great tale for MCA. Seventeen-year-old Ani Mayasandra, a second-round draft choice for Infosys, scored his maiden half-century against Tata on Saturday afternoon at the Canton ground, carrying his bat for an unbeaten and chanceless 55, as Infosys chased down 136 in 15 overs. He also took one wicket and one catch in Infosys’s second match, a defeat to Chrysler. Ani was Man of the Match for Infosys against Tata. Meanwhile, at Lyon Oaks, sixteen-year-old MCA wicket-keeper batsman Gordon Makin was the only G.E. player to reach double figures in the morning match against a strong Ford side (who would go on to beat Caterpillar in the semi-final on Sunday and Chrysler in the final), making a chanceless 34 in 17 overs (out of a total of 78), falling when the order to hit out came from the boundary as GE worked hard to build a fighting total; GE then battled to defend a disappointing score, after being put in by Ford (who were aware that dew would slow the outfield and make the wicket skiddy), but went down by 7 wickets. Chandon Sood for Ford took 3/9 in four overs, while Ford’s Sriram equaled Gordon’s 34 in a victorious reply, completed in 12.2 overs. G.E., obliged to play a second successive match against Ford (because of the late withdrawal of NYX), put in the automobile makers in the afternoon match, and saw them make a solid 150/8 off 20 overs (aided by a series of good partnerships, a number of missed chances, and 25 wides); Gordon took a fine diving catch behind the stumps. G.E.’s reply began well, as Gordon and Kumar put on 40+ in seven overs, but after the MCA opener fell for 16, well caught in the gully off a fierce edge, only Kumar (an impressive 51) offered serious opposition, and G.E. went down by some 40 runs. Ford’s Naupreet tormented the batsmen, taking four wickets in four overs. Details from the matches at Bloomer are yet to reach MCA, but it is understood that MCA’s third Corporate Cup player, twenty-one-year-old Anurag Yerabati (Motown-MCA vice-captain and a fourth-round draft pick) was given only one match by his BCBS team, but performed creditably. Two of tomorrow’s semi-finalists are known to MCA at the time of writing: Chrysler and Ford. Tomorrow’s final is scheduled for 2.30 at Bloomer Park, with live video streaming on the Internet. Further details of the USCCC will be posted when they become available. G.E. team between matches against Ford at Lyon Oaks on Saturday. MichCA has just announced tomorrow’s semi-final line-up in the U.S. Corporate Cricket Championship: Chrysler will play G.M. at Bloomer Park, match starting at 10; Ford will play Caterpillar at Lyon Oaks, match starting at 9.30. The final is scheduled for 2.30 p.m. at Bloomer Park. MCA players and friends are warmly encouraged to attend the matches. Radhakrishna Mohan, Youth Coordinator of the Staten Island Cricket Club (founded in 1872 and the oldest continuously operated cricket club in the country), this week contacted MCA to inform the Academy “that Staten Island Cricket Club is hosting a Youth Cricket Festival from August 29th to 31st, 2012.” He continued, “I am not sure whether any of your youngsters would be interested in joining us for this festival, either as a team or as individual members — we can accommodate some of the youngsters in our team or other teams…”. While MCA will not be able to field a team in the tournament, MCA members and associates are warmly encouraged to participate if they can, especially since last year’s festival was very successful. For more information, please contact Mr Mohan directly. Click here to download Festival flyer. This week MCA continues publication of an occasional series of articles on the history of cricket in Michigan. MCA’s Information Director has begun a research project to uncover the story of the sport in the State, and hopes to publish the preliminary results of his findings on this web site in the coming weeks and months. He would welcome any information about the story of the sport in the Detroit area and beyond; if you would like to share your memories or any information that might be of interest, please do not hesitate to contact him. At a recent match on Belle Isle a chance conversation with a spectator led to the beginning of a small research project on the history of cricket in Michigan. The spectator, who watched M.P.C.C. triumph over Lions C. C. in a MichCA T20 match, spoke of his shock at the state of the Belle Isle ground, on which he had played in the 1970s, when it was, he said, in excellent condition. In those days, he continued, two Detroit teams, one representing the East Side and one the West, played declaration games and also 20-over games (a reminder that what we now call the T20 format has been popular in club cricket for many decades) against clubs from southern Ontario. He mentioned Windsor, London, and Kitchener (presumably, these matches were in the Southern Ontario Cricket Association, which has a long, unbroken history of running the sport just across the border). Most of the Detroit cricketers in those days, the spectator added, were West Indian expatriates. It is well known that Belle Isle has hosted cricket matches for some time (and it is surely regrettable that the two grounds at a location of such potential appeal and pronounced visibility are now in such poor condition – if the island passes into the hands of new administrators, as seems likely, it is very much to be hoped that improvements on the two fields will be on the agenda). An article in Chicago’s Daily Defender for 2 July, 1957, reports a victory for South Park Cricket Club over Woodlawn C. C. at Chicago’s Washington Park and concludes “South Park this weekend invades Detroit for a July 4 cricket series with the Detroit C. C. at Belle Isle”. Further research will almost certainly reveal a rich post-war history for the game on Detroit’s most appealing island. More surprising, however, is the discovery that Belle Isle has hosted cricket matches for at least 97 years. A brief announcement in the Detroit Free Press for 12 June 1915 is headlined “2 Cricket Games Sunday: New League Will Start Matches at Belle Isle”. The initial matches would see North Detroit play West Detroit and East Detroit play South Detroit. The games were both to start at 2 pm, so there must have been at least two cricket fields. “A large crowd of cricket fans is expected at these opening games, as the great British sport has taken a firm hold here”. The names of the players mentioned in the announcement – Rennix, Stone, Collins, Dunbar, Dunn, and Robinson – suggest that this “great British sport” may have been played primarily by men of British origin, although West Indian participation should not, of course, be ruled out. The league has been increased to six teams and a crowd of new players are on the roll, many of whom are first-class players. Besides the league games, there will be a number of intercity matches to test the caliber of the local players. Last season Detroit played four games with outside clubs, beating St George’s [the great New York club, for which Cricketarchive records matches from 1840 to 1929; the Wikipedia article on the club provides some further information, noting, inter alia, that it was this club that hosted the first ever international match, between the USA and Canada in 1844], losing to Ridley College [St Catharines, Ontario], and at Cleveland, while rain stopped the Cleveland game here when the locals had a good margin. This year, for the first time, MichCA’s U.S. Corporate Cricket Championship held a draft of guest players: all participating teams were able to select up to four Michigan players, nominated by their clubs and not affiliated with the corporations participating. The four-round draft took place on Monday night in Farmington Hills, under the direction of MichCA’s Pankaj Mahajan and the tournament rules committee, of which MCA’s Joint Head Coach Vasanth Krishnaswami is a member. NYX Inc. has withdrawn from the tournament and Tata Technologies chose not to make any selections; the remaining seven teams had four choices each. Infosys chose MCA’s Ani Mayasandra in the second round and Blue Cross Blue Shield picked Anurag Yerabati in the fourth round. In addition, Gordon Makin will play for G.E. as a U-19 selection. MCA wishes all three players the very best in what should be an excellent tournament. The tenth annual U.S. Corporate Cricket Championship, organized by MichCA, will take place next weekend, with nine teams representing major corporations competing for the Cup. The Infosys team will be captained by MCA Joint Head Coach Shyam Mayasandra, while other MCA players and associates are likely to be involved. First round matches take place on Saturday at the Lyon Oaks, Bloomer Park, Belle Isle, and Canton grounds, with the semi-finals played at Lyon Oaks and Bloomer on Sunday morning, and the final scheduled to begin at 2.30 on Sunday afternoon at Bloomer. MCA Joint Head Coach Shyam Mayasandra invites MCA players and friends to join his Infosys Corporate Cup team for practice at Lyon Oaks today, Sunday 19 August, at 3 pm. Several MCA players have already confirmed participation; others very welcome. This week MCA begins publication of an occasional series of articles on the history of cricket in Michigan. MCA’s Information Director has begun a research project to uncover the story of the sport in the State, and hopes to publish the preliminary results of his findings on this web site in the coming weeks and months. He would welcome any information about the story of the sport in the Detroit area and beyond; if you would like to share your memories or any information that might be of interest, please do not hesitate to contact him. The anonymous author could well have been describing the conditions in which cricket is played early in the season in the State today. However, despite his praise of the ardent Pontiac cricketers, he could not resist a few digs, suggesting that this novice club, so far from the civilization of the East Coast, might risk reproducing the famous scene from Dickens’ Pickwick Papers (although Michigan readers will be amused to note that the author himself gets his details wrong, writing of “Dairy Dell”, instead of Pickwick’s Dingley Dell). Nonetheless, he promises, “when next we chance to sojourn in that goodly town of Pontiac, we propose to tell you something about the playing that will make you think twice before you sneer at backwoods Yankee cricketers”. A year later in the same publication, the column “Cricketer’s Chronicle”, under the pseudonymous byline of “Mint Julep” (a nom de plume that suggests a particular approach to the game), a long article related that “The first ever game of cricket played in the State of Michigan came off on the Pontiac Cricket Ground, July 13, between the Detroit and Pontiac Clubs, eleven of each joining in the contest” (Spirit of the Times: A Chronicle of the Turf, Agriculture, Field Sports, Literature and the Stage, 1 August, 1857). While both clubs were new, the Detroiters had more experience, although “the score of both parties was much smaller than they would ordinarily make, which perhaps may be charged to the excitement naturally attending the first match”. The two-innings match lasted from 10.00 until 5.00, with Pontiac, batting first, bowled out twice, for 42 and 27, respectively; Detroit made only 37 in their first innings, but 35/2 in the second, to win by eight wickets (the score card is reproduced in its entirety). “Mint Julep” reports that Pontiac struggled most of all against Armstrong, who took six wickets in the match, and whose “round hand” action was unfamiliar to the Pontiac batsman. For Pontiac, only Walters (11 in the second innings) and Cannon (10, in the first) reached double figures, while Armstrong made 18 for Detroit in the first innings, and Barrit (12 n.o.) and Mend (15 n.o.) saw them home in the second. “Mint Julep” notes that notwithstanding the “exceeding heat of the day”, everything passed off most delightfully, and concludes his piece with another reference to Dickens, noting that the Pontiac club will work hard to make sure that no “penny-a-liner in the fair ‘City of the Straits'” can oblige “the whole public to laugh at the presumption of the Michigan Cricketers”. The final chapter in Motown-MCA’s “nearly” story for the regular league season was written on Saturday, when a depleted team lost to Canton C.C. on their home ground by eleven runs, despite bowling the opposition out for 154. For Motown-MCA, who lost the toss and were asked to field, Khayam Hashmi took 3/26, MCA Joint Head Coach Vasanth Krishnaswami took 3/30, and MPCC’s Apu took 2/19, while Rahul top-scored for the opposition with 36; MCA’s Gordon Makin took two catches behind the stumps. The away team must have been delighted to have restricted the opposition to such a low score on one of Michigan’s smallest grounds, but, despite fighting knocks from Jashwanth (35) and Hari (42), batting at nos 3 and 4, respectively, Motown-MCA’s ten men could not quite get over the line. Vijay Patel, opening, was the only other Motown-MCA batsman to reach double figures, scoring 19. For Canton Vishal and Rahul both took three wickets. Notwithstanding the disappointments of the regular season, Motown-MCA enter the second stage of the tournament with a chance to advance from the Silver Group, where they will play matches against two other teams from the bottom half of the table, with one of the three progressing to the semi-finals. Canton, 154 all out, defeated Motown-MCA, 143 all out, by eleven runs.